Calakmul was one of the most influential Mayan city-states through the Classic Period. One of the unique traits of the Calakmul city was its use of snakes as an emblem. It has also been called the Snake Kingdom in historical sources. The city had a population of 50,000 during its peak period. It linked significant importance to the female royal line as well and numerous depictions of Calakmul queens have been found in stelas recovered from its ruins. The city remained a major Mayan power in 5th and 6th centuries but its influence began to decline in the 7th century. Calakmul existed as a city with a significant population since 500 B.C. However, it was only later in the Classic Period that Calakmul became a major Mayan city with significant influence and regional power. The city is estimated to have reached the peak of its regional influence in the 6th century and continued to enjoy control of a vast region and alliances with many other cities well until the 9th century, although its power began to diminish after the 7th century. The city had thousands of structures and was a centre of commerce. It had a longstanding rivalry with the Mayan city of Tikal which continued until the 9th century. In the 9th century, Calakmul was abandoned when the Mayan civilisation suddenly collapsed in the southern regions. Calakmul was one of the most influential Mayan city-states through the Classic Period. One of the most stand-out features of the political system at Calakmul was the presence of many queens in the ruling dynasty. In many stelas recovered from Calakmul, queens are depicted besides the kings. Evidence suggests that the female line was given importance not just in Calakmul but also in the states allied to it. It has also been theorised that a joint rule of kings and queens probably formed the highest power structure in the city. Archaeologists estimate that originally, Calakmul was home to 6700 structures. Many of these remain to this day. One of the extant structures at the ruins of Calakmul city is a 160 feet high pyramid with a number of stelas near its base. Another structure is a pyramid-temple which rises to 148 feet and has a huge base of 120 meters square. Structure of an extant ballcourt has also been discovered among the ruins. One of the most significant features of the city are a number of causeways built for ease of movement. These causeways range from those less than 100 meters in length, to causeways ranging up to 30 kilometres in length and linking Calakmul with other notable cities. In total, 8 causeways have so far been located near Calakmul ruins. Another remarkable feature of Calakmul is the vast network of canals located near the city. A number of huge reservoir sites have also been discovered among Calakmul ruins and the amount of water which could be stored make researchers estimate the population of Calakmul to be 50,000 or more. Calakmul was a major Mayan power during the Classic Period. During the same period, the city of Tikal dominated El Mirador and other Mayan cities, and rapidly rose to prominence and power. Calakmul successfully checked this power and remained the dominant of the two powers in the 6th and 7th centuries. During this time, Calakmul forged a number of alliances and put many allied states between Calakmul and Tikal. Ultimately, Tikal was able to defeat Calakmul at the end of the 7th century and gained more power and influence. But before Tikal could completely extinguish Calakmul’s influence, nearly all Mayan cities in the region succumbed to the 9th century Classic Maya collapse. Few remains of art from the Calakmul city are extant and most of these have survived because they are a part of the city’s architecture. These mostly include stelas and murals. A total of 117 stelas have been discovered among the ruins of the city and most of these depict kings and queens of Calakmul. The murals of the Calakmul are also unique among contemporary Mayan art in that they depict common people, engaged in everyday activities. Some of these murals are accompanied with hieroglyphic descriptions and many of them show activities in the Calakmul marketplace. Another source of Calakmul art are the ceramics recovered from the site. Many of these ceramics bear the snake emblem of the city. 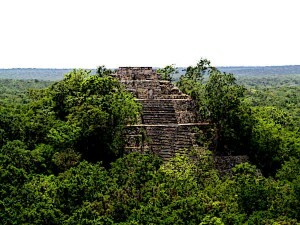 After the defeat at the battle against Tikal in 695, the decline of the city of Calakmul began. In subsequent years, Calakmul lost many of its allies in the neighbouring areas. Stelas recovered at the site depict several kings of the city during the 8th century, which show that although Calakmul declined in its regional influence, it was not abandoned and continued to exist as an independent city. Evidence dated to the 9th century, however, reveal that the effective collapse of the city had already begun. This coincided with the collapse of the Mayan civilisation, at large, in the southern regions. And it is quite probable that the same factors which led to the collapse of the civilisation at large also affected the collapse of the city of Calakmul. In modern times, the ruins of Calakmul city were first discovered in 1931. This immediately led to a large-scale exploration of the site and the mapping of its structures. In late 1930s exploration of the site stopped and was resumed later in 1982. Today, the city is deemed a known historical heritage site and is considered a key part of the Mayan civilisation. Calakmul was one of the most influential cities in the southern Mayan regions during the Classic Period. The city rose to prominence and power during the 5th and 6th centuries. During this period, Calakmul had a population of more than 50,000 and had alliances with a number of neighbouring states. The city had a longstanding rivalry with another major Mayan city, Tikal. And the two were pitted against each other for many centuries. While Calakmul remained more influential until the end of 7th century, it lost a major battle to Tikal at the end of the 7th century. With this defeat, the influence of the city of Calakmul began to decline. It collapsed towards the 9th century when the Mayan civilisation in the region at large collapsed. Calakmul is notable among Mayan cities for its people-centric mural depictions, the prominent mentions of its queens among historical sources and the construction of some of the largest pyramid-temples found in Mayan regions.